- This special concert brings together a wonderful selection of works by Liszt, Debussy and Ravel that were inspired by the composers' travels to different places around the world. 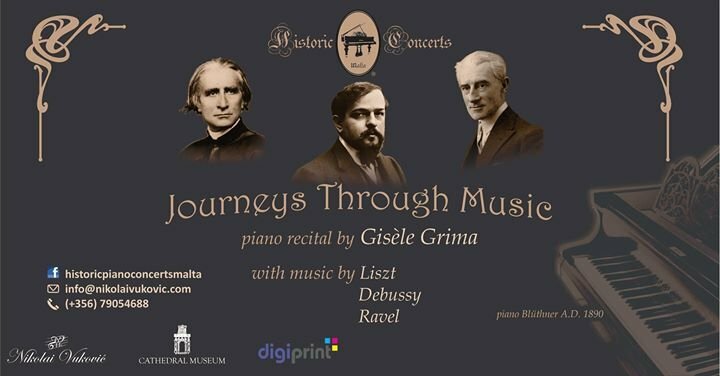 - Gisèle Grima, one of Malta's foremost pianists and a champion of the music of these three composers will take us upon this magical musical journey. - The use of a special grand piano dating to the time of these three composers (A.D. 1890) and of the brand Debussy favoured most - Blüthner, will also recreate the authentic sound for which these classical music masterpieces were composed and from which the composers drew further inspiration. - Art was another source of inspiration for the composers. The magnificent Cathedral Museum in the heart of Mdina, with paintings by famous painters like Mattia Preti, is the perfect setting in which such inspiration can be transmitted to the listener. - An exhibition by painter and sculptor, Chris Ebejer will be on display purposely for the evening. - Three halls of the museum will also be open throughout the evening, and patrons will be welcome to walk around and enjoy the Art.